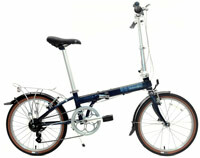 A few years ago, folding bikes were so unpopular and consumers have just a limited number of choices. At the moment, we can see them everywhere in the United States, from online retailers like Amazon to brick-and-mortar stores like Target, Walmart or Sports Authority. While this is good news for us, it also means you might have to spend a lot of time researching and deciding which is the best folding bicycle for your needs. We love folding bicycles and have tested hundreds of them, so we know this is not an easy decision, especially for inexperienced shoppers. 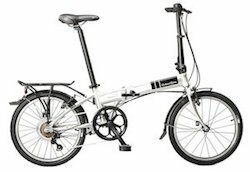 Why Should You Buy a Folding Bike? Many people have the prejudice against this type of bicycle because they think it is more expensive, bulkier and can’t compete with regular full-sized bikes. The viewpoint is no longer valid as there’ve been a lot of improvements in design and materials of folding bikes in the last decade. 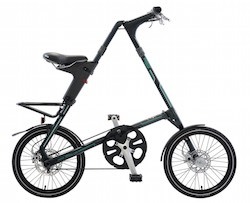 The disadvantage of being unwieldy is solved as folding bikes are so compact and lightweight that you can put two of them in your car trunk. The weight of most recent folders is made lower than 30 lbs and we even see some lighter than 20 lbs. We created an infographic to help you compare the differences between a folding and a regular bike. You will be able to find out more details in our comprehensive reviews. 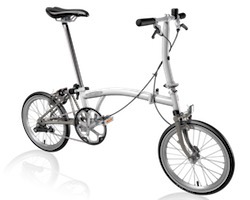 Folding bicycles are suitable for anyone who wants to use a bicycle at more places, for people who are aware of their health and looking for the most healthy and environmentally-friendly way to get around. Urban commuters would benefit the most from folding bikes because they don’t have enough space to store a conventional bike and need to solve the last-mile problem. For instance, you need to use the bicycle to ride from home to a bus/subway station, carry it on board, and then complete the trip to your destination on your bike. Only a folding bike can be compact and convenient enough to help you in this case without any permission or restriction. Moreover, you can roll it along station platforms and carry it upstairs easily. 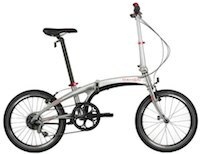 Here we are presenting a list of high-quality folding bikes available in the US as well as in many other countries. Folded Dimensions: This is the size of a bike after it is folded. 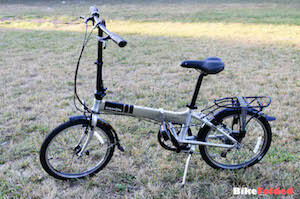 Normally, a folding bike can decrease the size at least by half when folded. 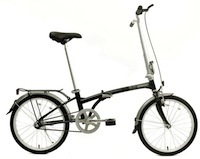 The wheel size and frame design will decide how compact a folding bike is. The most common wheel sizes are 16 inches, 20 inches, and 24 inches, you can see their differences in this video. Weight: This is another important factor you need to consider when buying a folder. 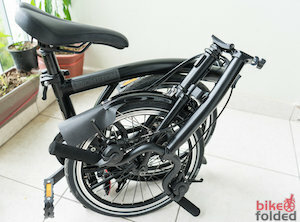 A lightweight folding bike will be much easier to carry around, check out a list of the most lightweight folding bikes. 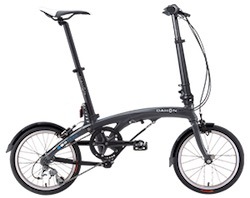 Speeds: The bicycles can have from 1 to over 20 gears (speeds), which are provided by the front and rear derailleurs. More gears are not necessarily better, so wisely choose the number of gears based on the road you will be riding. Frame: Nobody wants a heavy and poorly made frame. The frame design and material will directly affect the weight and durability of your bike. Most bikes use aluminum or good-quality Chromoly steel. Price: The folders are generally more expensive than regular bikes but they are so affordable right now. We put manufacturer’s suggested retail price (MSRP) on the table but they often go on sale for up to 60% off. So, the real price ranges from $100 to $5,000. 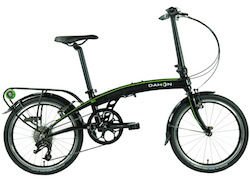 There are over 100 folding bikes available on the U.S. market, so if you are having a hard time figuring out the best bike for your needs and budget, below are our recommendations. 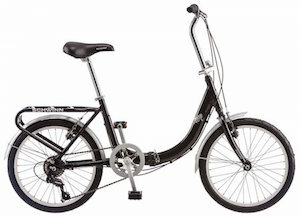 Undoubtedly, the Schwinn Loop is among the cheapest folding bikes on the market. Although it is a little heavy and bulky due to the steel frame, it is totally acceptable for such a low price. It is not by chance that the Loop is still selling like hot cake since its release nearly a decade ago. This is my first folding bike and I haven't had any issue in the last 4 years. It is built to last and perfectly suitable for any rider with a low budget. 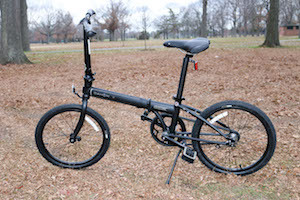 The Mariner D7 is the most versatile folding bike that doesn't break your wallet. It has almost everything you will expect in a folder. 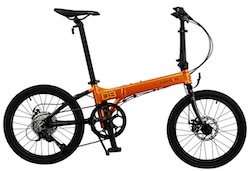 It is lightweight with compact folded size, it has a sturdy frame, a sleek rust-resistant coating, and comes with a 7-speed drivetrain, a rear rack, and fenders. The Dahon bike is a safe choice and you never can go wrong with it. 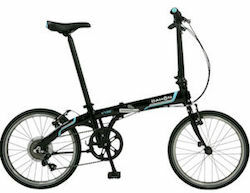 There is nothing to complain about the Brompton. It is incredibly beautiful with a classic design. The folding mechanism is the best of all folders I've ever used. Besides, it delivers very comfortable, stable, and fast rides, thanks to the wide gear range and a long wheelbase. You can also customize the bike with a variety of accessories, and replacement parts are widely available.